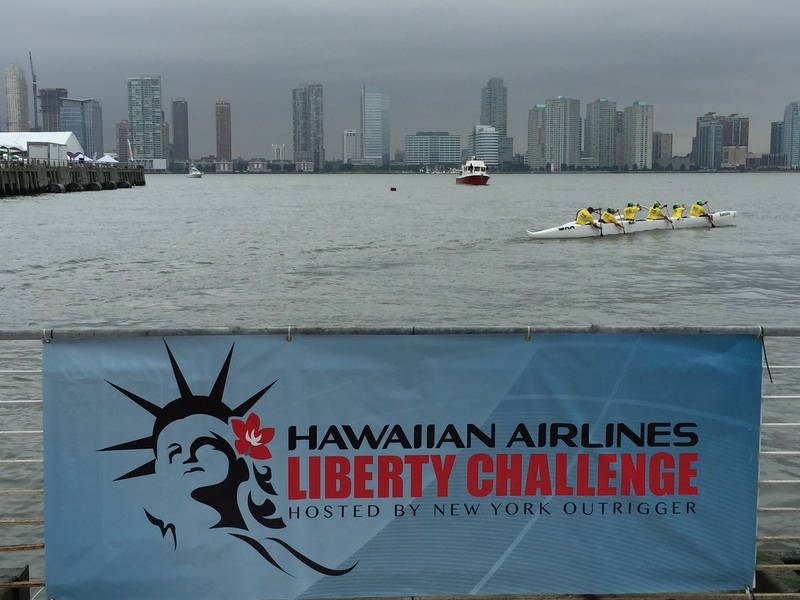 Kaua`i was well-represented at the 19th annual Hawaiian Airlines Liberty Challenge in New York City, the largest outrigger race on the east coast. The six-man canoe race covered 15 miles of the Hudson River in Manhattan; starting at Hudson River Park’s Pier 26, it wound around both the New York and New Jersey shores and passed some of the city’s great sights, such as the Statue of Liberty, Governor’s Island, the Manhattan and Brooklyn Bridges, and the 9/11 Memorial Tower. Spectators watched from multiple viewing points along the river, and a high-tech tracking app allowed them to follow the canoes throughout the entire race. 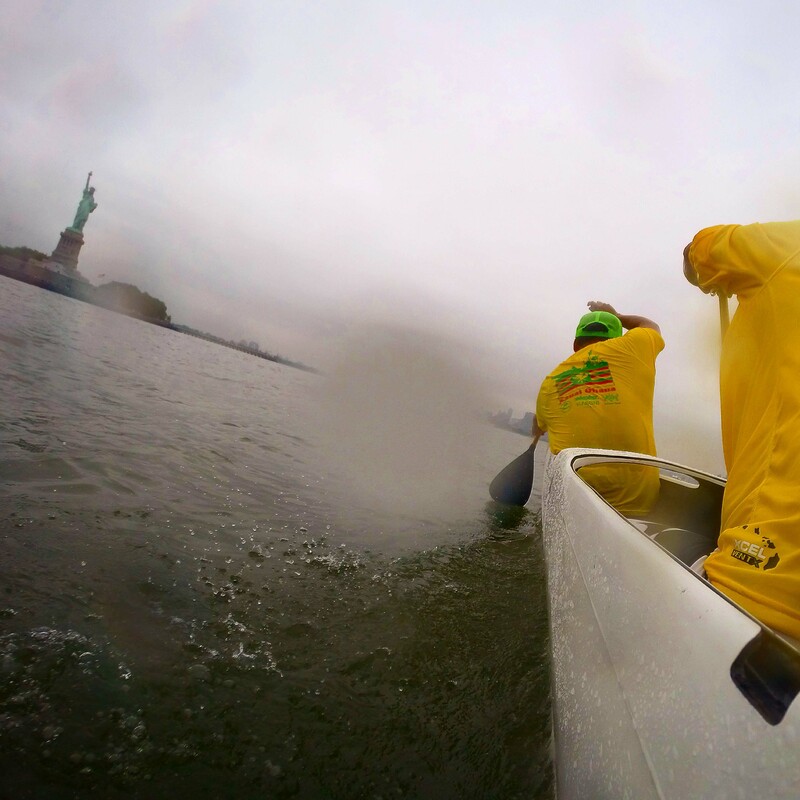 The conditions on the Hudson River are what make this race challenging. Strong, shifting tidal currents and winds, together with passenger ferries, tour boats, tankers, barges and pleasure boats, create obstacles unlike any on Kaua`i. The steersmen followed the best course to take advantage of the currents and boat wakes, while staying clear of docks and river debris; police and safety boats frequently stopped the canoes to allow large ships to pass through the race line to maintain the busy harbor’s schedule. The mixed division, won by an all-Kaua`i crew of team captain Keone Miyake, Dana Miyake, Melissa Burovac, Kalani Vierra, Marina Loew and Luke Evslin, paddled 11 miles, a slightly shorter course due to increased boat traffic and more hazardous conditions in the afternoon. The mixed Kaua`i Ohana crew won by several minutes, after an intense battle at the starting line resulting in damage to multiple boats. The second all-Kaua`i crew, Kaua`i Wa`a, placed second in their division, missing out on top honors to the Brazilian team by only two seconds. This crew consisted of team captain Shaydon Moises, Keawe Smith, Spencer Smith, BJ Aiwohi, Jonah Enrique and Tiloi Alapa. Other Kaua`i paddlers competed with off-island teams, resulting in podium finishes for every Kaua`i participant. Noe Sawyer and Alana Frasier won the women’s division with Team Bradley; Luke Evslin placed second in the men’s unlimited division with Team Kamanu before steering Kaua`i Ohana to their first place finish; and Sokchea Evslin steered Team Singapore to third place in the women’s race. Participants of the race came from 74 teams, representing seven countries, including Hong Kong, New Zealand and Australia. They were treated to a Hawaiian-style luau after Saturday’s race, complete with hula from a New York halau. All teams took advantage of beautiful New York to sightsee Times Square, Central Park, and attend a Yankees game. Host club New York Outrigger demonstrated that Aloha can be found everywhere. This is what was published.